A season already under a pall following the deaths of Gilles Villeneuve and Ricardo Paletti became even grimmer when championship leader Didier Pironi crashed his Ferrari heavily in practice at Hockenheim and broke both his legs. 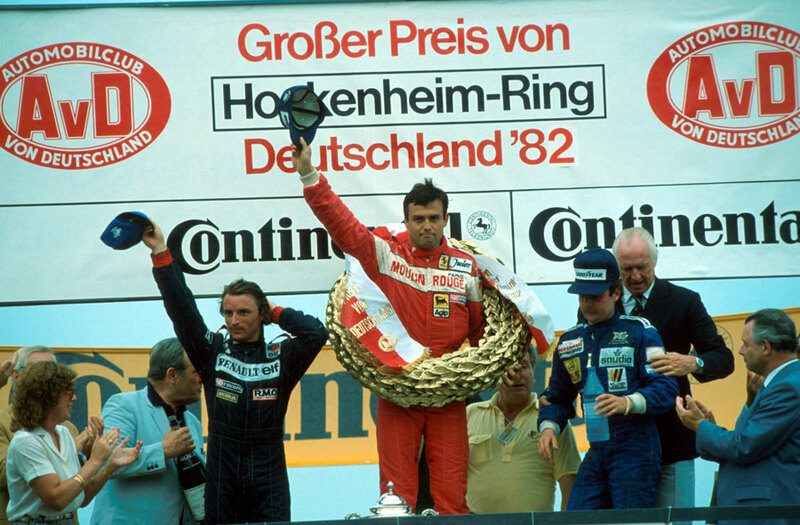 Team-mate Patrick Tambay won the grand prix the following day but it was little consolation for the devastated Ferrari team. Pironi had been on a flying lap in Saturday practice held in heavy rain. The spray hovered between the trees in the forest like a fog and visibility was limited. Pironi came up on Derek Daly's Williams which moved out of his way and Pironi assumed this was to let him by. He accelerated harder to 160mph but in the spray had not seen Alain Prost's Renault. He hit the back of it and that launched him into the air. "It was 30 meters in the air," Prost recalled. "It landed on its rear and then its front and was cut in two. It was absolutely atrocious." The Ferrari was airborne for many seconds and came crashing down nose first smashing Pironi's legs in the process. He was in agony when medical delegate Sid Watkins arrived. For a time amputation was a real prospect, and while he did recover he never raced again. Alain Prost led but was chased by Nelson Piquet who passed the Renault on lap two and then pulled away with ease. Piquet was doing his bit but his result depended on the pit crew. His lead was growing all the while and it looked as though the strategy was working until he came up to lap Chilean Eliseo Salazar who misjudged Piquet's speed as the Brabham came up to lap him. They made contact and both crashed out, and there then followed a much-replayed fight when the mercurial Piquet kicked and punched Salazar on the side of the track. It emerged Piquet's car wasn't that badly damaged but his anger got the better of him when actually he could have continued. Prost retired with fuel injection problems after 11 laps, and thereafter it was Tambay, who had replaced Villeneuve, in the lead and one fumbled gear change aside, his drive was faultless. Rene Arnoux, plagued by understeer, was second from Keke Rosberg, the latter lapped by the winner as he struggled with gear selection issues. Pironi still led the championship by nine points from John Watson, but with his season over, the title race had been blown wide open, even if only those driving turbo-engined cars were in the hunt.